The newly released “2017 Cancer Facts and Figures” report shows the negative impact of the USPSTF recommendation against the PSA. While the estimated number of new cases is down from last year, the estimated number of deaths from the disease has increased. Fewer men are being tested for prostate cancer, and more men are dying because of it. 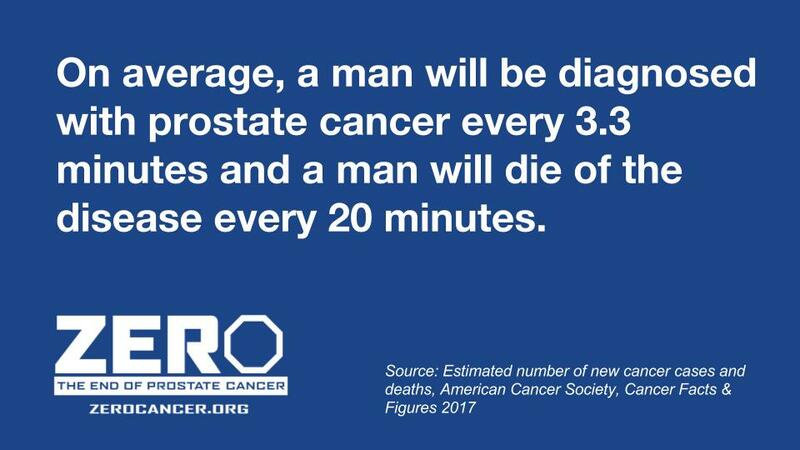 An additional 610 men will die from prostate cancer this year compared to 2016. Read the full report – compiled by American Cancer Society from National Cancer Institute SEER, NAACCR, and CDC data. It’s more important now than ever to divorce USPSTF recommendations from insurance coverage and general practice doctors’ preventative care protocols. ZERO is fighting for men by advocating for revised USPSTF recommendations, offering free navigation care to patients, and opening a grant system to combat financial toxicity that causes too many patients to end their treatment prematurely. Find out how you can help by signing up for our advocacy alerts. Thank you to all who answered the call with your generosity to help prostate cancer patients this holiday season. The End of Year donations are already being put to work to assist men and their families on their prostate cancer journeys! You truly are the help and the hope for so many men. We are grateful to have such a supportive ZERO community! Reach out to Kathy Costigan for any assistance with your giving plans to help our cause. We’re thrilled to announce the upcoming launch of “The Journey to ZERO,” a new blog dedicated to being the voice of the prostate cancer movement. With compelling, thoughtful articles from patients, advocates, donors, ZERO staff, and other members of the prostate cancer community, The Journey to ZERO will offer readers a chance to connect and stay up to date on the latest goings on! Visit our website for more information on the launch of our new blog! Want to make an impact in the fight against prostate cancer? 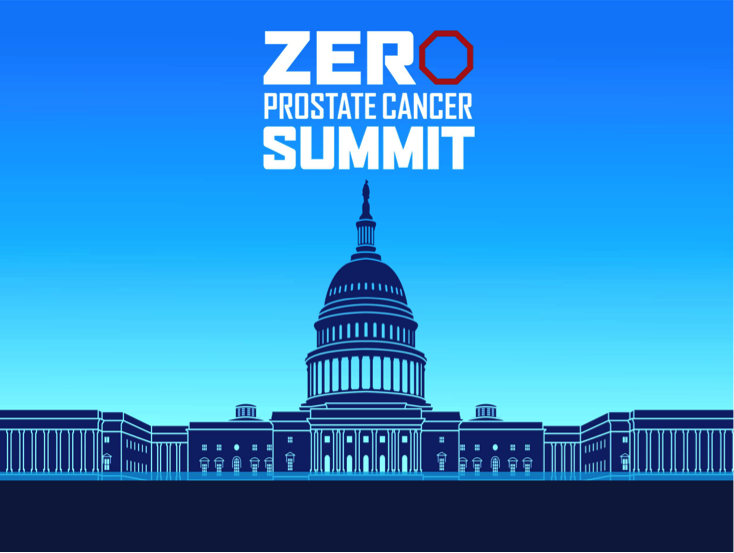 Join us for our Annual Advocacy Summit, where we engage with more than 70 congressional members that have influence over prostate cancer funding and legislative priorities. With your help, we can make a statement on Capitol Hill during the 2018 appropriations process! We’re still looking for advocates to join us from select targeted Congressional districts! Do you live in Alabama, Georgia, Illinois, Indiana, Massachusetts, Mississippi, Montana, New Jersey, Oregon, or Texas and want to make a difference in the fight? Apply today and join the more than 100 passionate prostate cancer advocates in DC on February 27 – March 1. 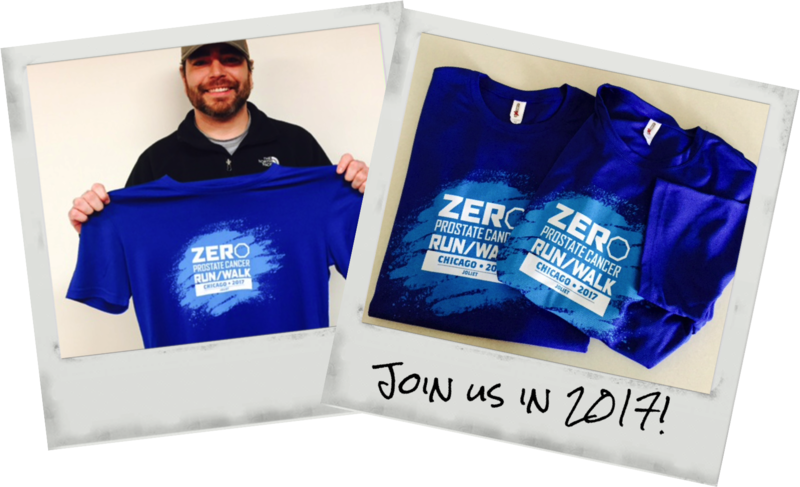 2017 is just getting started, and so is ZERO’s Run/Walk series! We’ll be debuting these brand new race shirts in more than 40 cities starting in June, and we’d love to see you there! The ZERO Prostate Cancer Run/Walk is the time we come together, raising funds and sharing hope to declare one number above others: ZERO. Your participation makes a real difference in the lives of men and families fighting prostate cancer. We fundraise, run, and walk in honor of the three million prostate cancer patients and survivors in the hope that one day we will achieve Generation ZERO: the first generation free from prostate cancer. Find out when the Run/Walk is coming to a city near you! Don’t see your city quite yet? Check back soon, as we’ll have new races launching each week. 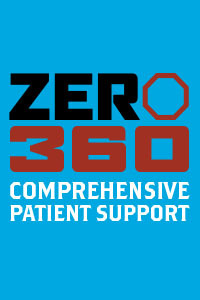 ZERO360’s free services include: insurance navigation, screening and enrollment assistance, financial aid help, employee benefit services, emotional support, and more. Take advantage of this free service, so you and your loved ones can focus on your health. 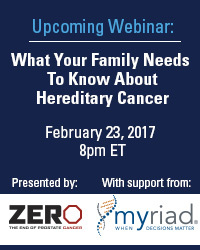 Join us for a webinar on February 23 at 8 pm EST that will discuss why it is important for prostate cancer patients to know if they are a BRCA gene carrier even after diagnosis and treatment. More info coming soon; save the date!